In a $7.2 billion deal, Microsoft will buy out Nokia's smartphone division. Microsoft boss Steve Ballmer has announced via a staff e-mail that the technological giant responsible for Windows and the Xbox is set to acquire Nokia's Devices and Services business, as well as license the companies patents and mapping services. 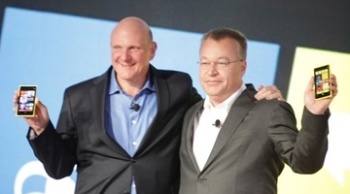 EUR 5.44 billion ($7.2 billion USD) will change hands, and current Nokia CEO Stephen Elop will become Microsoft's new executive VP of Devices and Services. What makes this deal particularly interesting is that Elop had actually worked for Microsoft's business division from 2008-2010, before going on to become the first non-Finn CEO of the Finland-based Nokia corporation. 32,000 other Nokia staff will also transition to new positions at Microsoft. Nokia and Microsoft have already been working together for more than two years, and partnered to produce the Lumia brand of phones, as well as Nokia being Microsoft's biggest hardware partner on the Windows Phone 8. In this deal, Microsoft will acquire Nokia's Smart Devices division, which includes the Lumia brand. Balmer claims that the move will not, however, lock other potential hardware manufactures out of the Windows Phone platform.